Austro-Hungarian city, capital of Croatia and Slavonia, situated near the Save river, about 160 miles from Vienna. 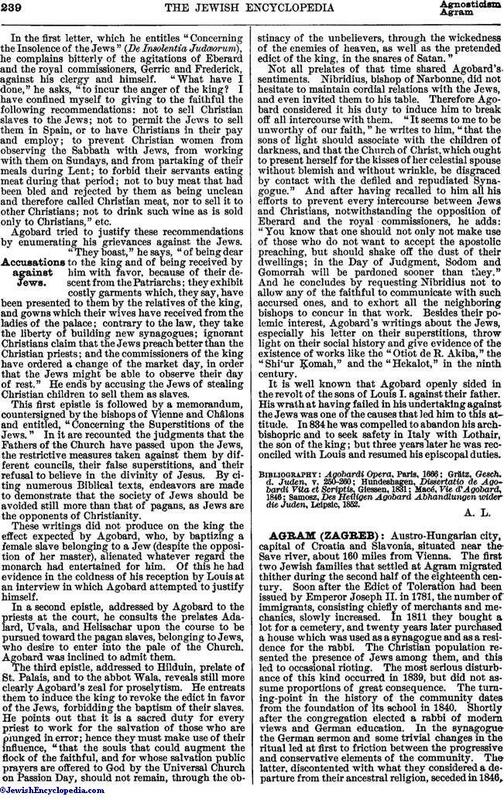 The first two Jewish families that settled at Agram migrated thither during the second half of the eighteenth century. Soon after the Edict of Toleration had been issued by Emperor Joseph II. in 1781, the number of immigrants, consisting chiefly of merchants and mechanics, slowly increased. In 1811 they bought a lot for a cemetery, and twenty years later purchased a house which was used as a synagogue and as a residence for the rabbi. The Christian population resented the presence of Jews among them, and this led to occasional rioting. The most serious disturbance of this kind occurred in 1839, but did not assume proportions of great consequence. The turning-point in the history of the community dates from the foundation of its school in 1840. Shortly after the congregation elected a rabbi of modern views and German education. In the synagogue the German sermon and some trivial changes in the ritual led at first to friction between the progressive and conservative elements of the community. The latter, discontented with what they considered a departure from their ancestral religion, seceded in 1846,and formed another congregation. In the mean time political questions occupied the attention of the community. The united congregations of the kingdom of Croatia (Agram, Kreutz, Warasdin, and Sissek) petitioned the Hungarian parliament to grant them the franchise, but their petition was rejected. The year of the revolution, 1848, witnessed insignificant rioting in Agram, in spite of which the Jews affiliated with the Croatian party, and some of them also served in the army that fought against the Hungarians. In 1850 the keeping of records of births, marriages, and deaths was introduced, and the school, which had grown to such an extent that it required five teachers to instruct the classes, was reorganized. The conservative party of the community continued its separate organization, although in 1852 the governor had ordered it to disband, and threatened to punish every attempt at secession. But in opposition the archbishop, George Haulik, encouraged the conservatives, granting them a lot for a cemetery and a new synagogue. Four years later both congregations united and formed a new organization which lasted until 1867, when the introduction into the synagogue of an organ caused another secession of the conservative members. In the meantime the political conditions of the community had been improved by the right to own real estate, which was granted them in 1860, but a petition for full franchise, repeated in 1861, was again rejected. 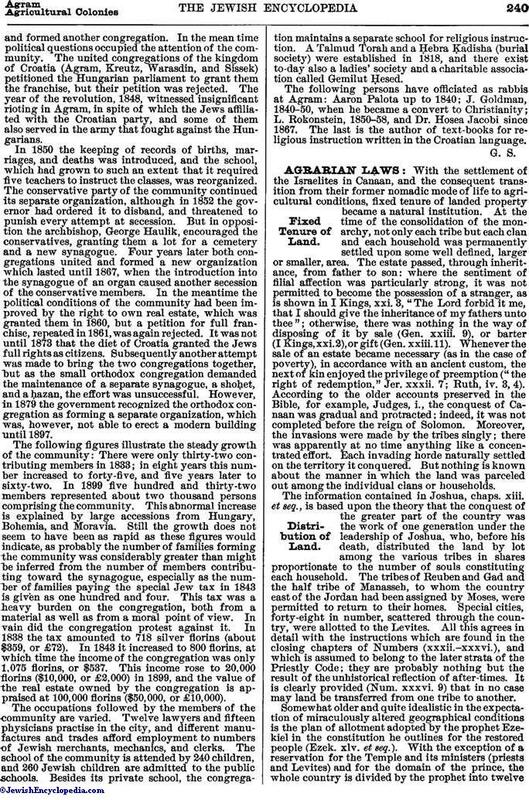 It was not until 1873 that the diet of Croatia granted the Jews full rights as citizens. Subsequently another attempt was made to bring the two congregations together, but as the small orthodox congregation demanded the maintenance of a separate synagogue, a shoḥet, and a ḥazan, the effort was unsuccessful. However, in 1879 the government recognized the orthodox congregation as forming a separate organization, which was, however, not able to erect a modern building until 1897. The following figures illustrate the steady growth of the community: There were only thirty-two contributing members in 1833; in eight years this number increased to forty-five, and five years later to sixty-two. In 1899 five hundred and thirty-two members represented about two thousand persons comprising the community. This abnormal increase is explained by large accessions from Hungary, Bohemia, and Moravia. Still the growth does not seem to have been as rapid as these figures would indicate, as probably the number of families forming the community was considerably greater than might be inferred from the number of members contributing toward the synagogue, especially as the number of families paying the special Jew tax in 1843 is given as one hundred and four. This tax was a heavy burden on the congregation, both from a material as well as from a moral point of view. In vain did the congregation protest against it. In 1838 the tax amounted to 718 silver florins (about $359, or £72). In 1843 it increased to 800 florins, at which time the income of the congregation was only 1,075 florins, or $537. This income rose to 20,000 florins ($10,000, or £2,000) in 1899, and the value of the real estate owned by the congregation is appraised at 100,000 florins ($50,000, or £10,000). The occupations followed by the members of the community are varied. Twelve lawyers and fifteen physicians practise in the city, and different manufactures and trades afford employment to numbers of Jewish merchants, mechanics, and clerks. The school of the community is attended by 240 children, and 260 Jewish children are admitted to the public schools. Besides its private school, the congregation maintains a separate school for religious instruction. A Talmud Torah and a Ḥebra Ḳadisha (burial society) were established in 1818, and there exist to-day also a ladies' society and a charitable association called Gemilut Ḥesed. The following persons have officiated as rabbis at Agram: Aaron Palota up to 1840; J. Goldman, 1840-50, when he became a convert to Christianity; L. Rokonstein, 1850-58, and Dr. Hosea Jacobi since 1867. The last is the author of text-books for religious instruction written in the Croatian language.